Are You Up for the Red Rope Challenge? The Red Rope Challenge is to tie 14 knots in under one minute. Impossible, you say? Not with the help of the Scouts and Scouters who have already earned their red rope. The test for the challenge is done in front of the troop and judged by an existing Red Roper. The challenge is open to all Scouts and Scouters, and may be repeated as many times as it takes to pass, one time per meeting. Scouts and Scouters interested in meeting the challenge may check out a blue training rope from Mr. Remley. This rope is to be returned to the troop when the red rope is earned, or when the challenger ceases to work towards the challenge. As long as there is continued effort to meet the challenge, the blue rope may be kept. Failure to return the rope when requested will result in a $10 replacement fee. The challenge requires not only knowledge of the 14 knots, but also the technique and skill to quickly transition from one knot to the next. Red Ropers will conduct periodic training sessions for those interested at troop meetings and outings. Once the Red Rope is earned, the challenger will become an instructor. He will also wear his Red Rope as part of his uniform. 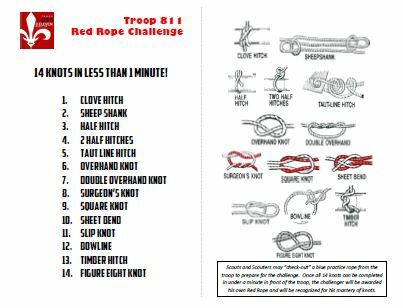 In addition to instructing Scouts, Red Ropers who are interested in an even tougher challenge may attempt the Black Rope Challenge. Comments Off on Are You Up for the Red Rope Challenge?